Rustic Modern - 6 bedroom lakefront house - sleeps 12 - private association beach! Rustic Modern - 6 bedroom lakefront house - sleeps 12 - private assocation beach! 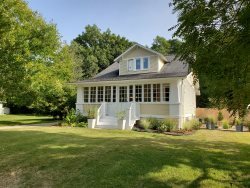 This home is quietly nestled in the woods above the dunes, overlooking your private beach on Lake Michigan. The décor of this home is very much in tune with a true “cottage style”. Comfortable spaces with hard wood floors and pine walls throughout add to the warmth and charm. The three floors of this home offer privacy for everyone in your group. The main floor consists of the common areas of the kitchen, living room and large deck. Upstairs you will find two baths, the two larger bedrooms; one bedroom with a King, the other with two twins. There are plenty of fans and windows letting in the cool lake breeze, however no air conditioning.